Sometimes coincidences matter, and are fortuitous. Yesterday I was at a final walkthrough with some buyer clients from out West and the conversation turned to stink bugs. What are they? Where are they from? What do they do? I knew they stink, and they seem to have replaced the bad lady bugs, aka Multicolored Asian Lady Beetles. Stink bugs were bad last year. This year they’re worse. And they’re not from here. 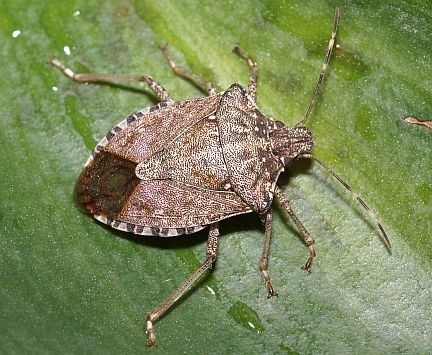 The Brown Marmorated Stink Bug (BMSB), is found throughout Virginia although some isolated pockets of the Commonwealth have not seen this insect yet. The BMSB is an invasive insect not native to Virginia or North America. It was accidentally introduced near Allentown, PA in 1998 and has spread since that time. It feeds on a wide range of fruits and seed pods and has the potential to be a pest on peaches and soybeans. For homeowners, it is mainly a nuisance pest, as it invades houses in the winter looking for a place to over-winter. Driving to my next meeting, I turned on Coy Barefoot’s show on WINA and heard last year’s conversation with Peter Warren, an entomologist at the Extension Office. The conversation was informative, useful and answered all of my stinkbug questions. I recommend listening to the whole thing. Found two in the car yesterday. Ugly-looking things. I’ve *heard* that VT has a group devoted to studying ladybugs. Don’t know if it’s true or not, but every year we seem to be inundated at some point with hundreds of thousands of them for a week or so. I’ve been out of town for work for the last week and only realized what time of year it was when I stopped by a sick friend’s house yesterday to check on her. There were stink bugs creeping around her windows and moldings. I just know there’s going to be a little crew of them in my office when I get back in there tomorrow morning. They infest my office every year and I just can’t get used to them. Ugh! For the past week, it seems they all hatched or something. The volume of stinkbugs is unprecedented, in my experience. I have been seeing them for years now but they are worse this year. We have a log house and they can’t seem to get in. They are on our doors and window screens. At firs I did not know what they were so I just called them ” ugly bugs.” I really do noy smell anything. Maybe you have to squuese them or startle them. Like the person said in the previous reply, they might have replaced the Ladybug. We had thousands in the past three or four years and they did get in our house. We had to vaccum them up twice a day. Well they are God’s creatures but do there have to be so many? We relocated to Charlottesville from Northern California and love everything about it except STINKBUGS!!! I can’t stand bugs in my house to begin with and these things are more like little beetles. Everytime I open a door (live in Lake Forest South) they sneak in and invade us.